….I had to wipe my muddy hands on my pants and dash back inside to get my camera. Woof! They’re finally here! They really had me worried this year! I haven’t seen butterflies all year, it was a true relief to see these caterpillars appear, seemingly out of nowhere. 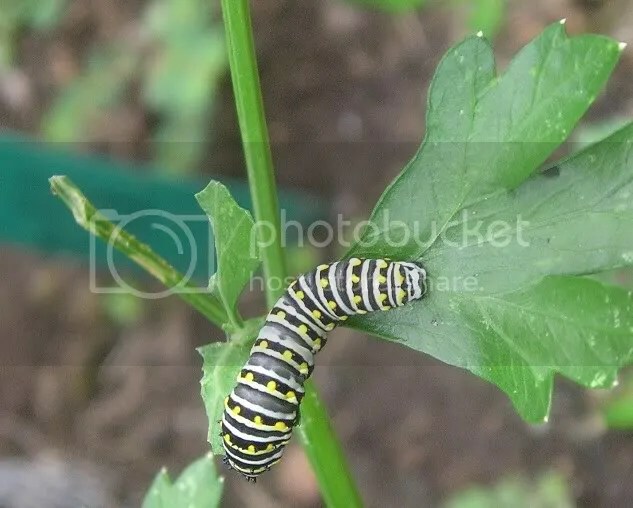 I happy to give my parsley to the caterpillars, they need the parsley-energy so much to prepare for the chrysalis. Dine on, my little striped friends, dine on!! 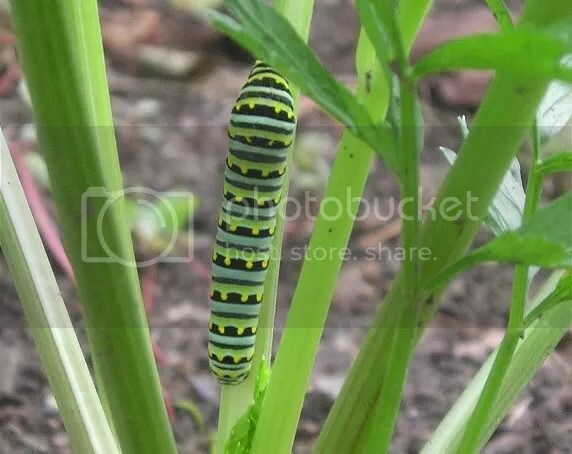 I believe it’s the black swallowtail caterpillar. There are also tiger swallowtail caterpillars, I’ll take photos of them too, when they’re bigger! I did NOT know thorny pigweed was good for anything, all I know is their thorns practically make my fingers numb! I’ll be your partner in the pigweed biz! I was so sad not to have any butterfly larvae this year. I’ve always had them in the past. I have tons of dill planted just for them. I occasionally get them on the parsley, but usually they go for the dill. I didn’t see any butterflies, so this was quite unexpected. I hope yours show up too! It just took a bit of time but of course they would show up. I am so happy they did! I was so worried! What a relief! Thanks for stopping by, Tina. It’s a beauty! Congrats. I forgot to do parsley this year. Can you believe it! I always plant it, but simply forgot this time. Thank you Barbee, I’m sure they’ll be able to find something else tasty. I read they also like citrus plants. Go figure. Thanks for stopping by! What gorgeous photos, Lzyjo!!! We have tons of milkweeds for the monarchs; I need to go out and see if anybody’s found them this year. Thank you! You might just be surprised and find some! The little ones are so small so do look carefully! Thank you, Gail. I love the Warner Parks, a very special and beautiful place. That’s sad about the butterflies. I swear I saw no more than one this entire Summer. I believe it is a conspiracy of circumstances, the cool wet weather combined with synthetic and biological crops agents, etc., it’s an unfortunate problem, I do hope next year is better! Edwin Warner Park! Oh, my, talk about bringing back childhood memories!!! Warner parks are so special, lots of good memories are there! Boo hooo! I got not a one! Yours looks very happy, though. They are very happy and getting fatter all the time! Maybe there’s still time for you to find them. I know you have lots of great things to attract them. Thanks for stopping by.